Go north, west, climb the stairs, then go on north and west. Go on west, then go north into the town. Take a look at the merchant. He will offer you the Kinstone Bag. Accept to fuse Kinstones with him, this will open a tree in South Hyrule Field. You can go there to find another Piece of Heart. Wander around the town to gather some Kinstones. 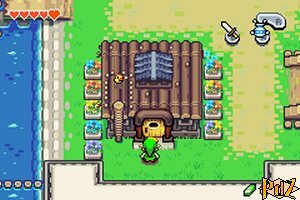 Get to Stockwell's Shop in the south district and if you have close to 100 rupees, buy the Big Wallet for 80 rupees. Also go to Swiftblade, the sword master, to the southwest. Hear his lecture and you will receive a Tiger Scroll. Go northwest and leave the town after performing a Spin Attack in front of the guard. Go south and go down the ladder. Drop a bomb against the wall between the two torches and go forward. 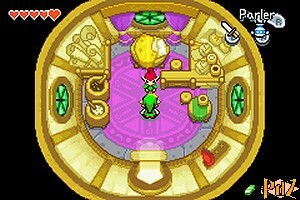 (If you don't have bombs anymore, buy some in Hyrule Town). Raise your shield in front of the Business Scrub and buy a Bottle for 20 rupees. Get out, go north, cross the bridge, go east and go down the stairs. Fill your bottle with water, then come back and cross the bridge again. Next go west.